Thank you, David. Will those of us who clicked buy and were charged be automatically refunded the 5 yocash, or do we need to submit a ticket? Same thing happened to me, charged 5yc when it's "Free"
I just got charged 5 yo cash for the FREE gem event room. Can you please FIX this glitch and REFUND my 5 yo cash. I would not have bought this room for yocash I save that for houses and furniture. I hope you guys will refund the 5 YC because it is SUPPOSED TO BE FREE! I thought it was just me! I was charged 5 yocash too, I thought it was free? Ya I claimed it free and it never showed in my inventory, so I decided to claim again and noticed it was 5yc instead of free so I dared not! Also I tried to open the initial chest in the new gem event to activate the gem event and it would not allow me to do so! Must be a glitch. Last edited by Moloch (153939982) on Mon Feb 11, 2019 5:10 pm, edited 1 time in total. Emily (131426504) wrote: I just got charged 5 yo cash for the FREE gem event room. Can you please FIX this glitch and REFUND my 5 yo cash. I would not have bought this room for yocash I save that for houses and furniture. I hope you guys will refund the 5 YC because it is SUPPOSED TO BE FREE! There is a thread about this already- they are looking into it. Last edited by Mrs Poker (2830693) on Mon Feb 11, 2019 5:10 pm, edited 1 time in total. Wish I would've read forums before getting in game, didn't expect to be charged for the free room..
Good golly - 6th thread on this. 1pm PST still doing it, do we know a fix ETA? 2010 VDAY SALE @ Apartment!! Just got charged 5 yocash for the FREE room. Can BVG reimburse us, I actually did NOT want to buy it...but if something says free, it is FREE, IMO...Thanks so much. May all your trails be happy ones! looking for some answers and what happened, be back with an answer to that soon. Same here, I hope it gets fixed soon. 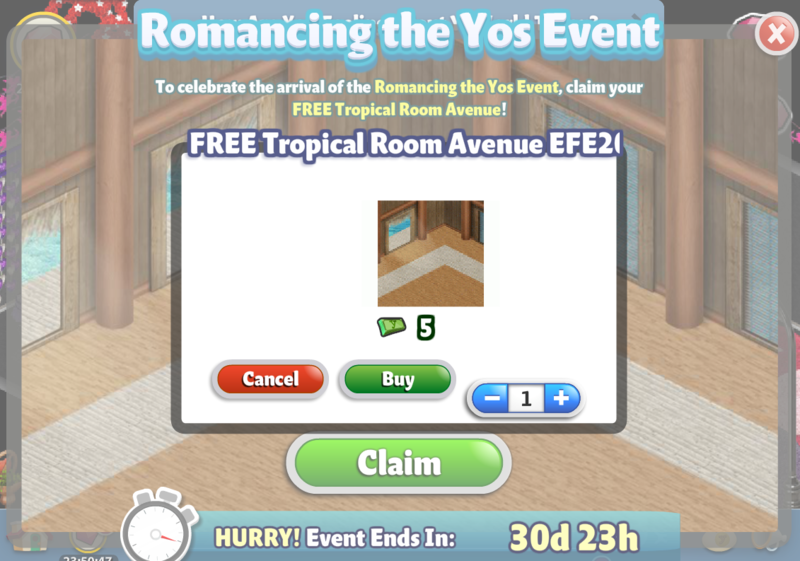 Karena (130161749) wrote: :sad: Just got charged 5 yocash for the FREE room. Can BVG reimburse us, I actually did NOT want to buy it...but if something says free, it is FREE, IMO...Thanks so much. LOL the gem event is on strike! i got charged as well and i cant open the first chest, anyone else cant open the first chest?